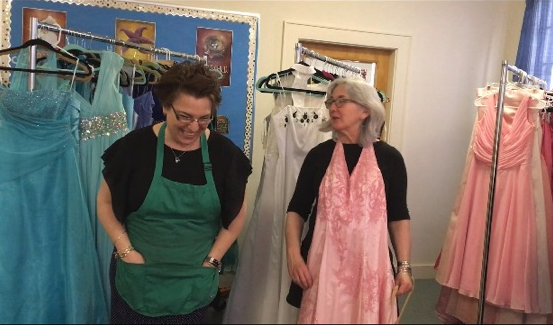 NEWMARKET – Kat Murphy is busy trying to find loving homes for 200 evening gowns that she hopes will make it to a prom somewhere soon. She is closing up at 7 p.m. Sunday at the Newmarket Community Church in Newmarket, but will be available by appointment if you call 603-534-0606. Donations are accepted, but not required. It’s called Prominence and started at Exeter High School, but Murphy moved to Newmarket when she ran out of room. But right now, the focus is on upcoming proms in Exeter and Newmarket. It doesn’t matter where you will be wearing the gowns and Murphy has a sewing machine on hand if your dress needs a little tailoring. And Murphy had cookies and snacks to eat Sunday while prom-goers decided which dress suited them best.